Joan Osborne's new album, Songs of Bob Dylan, will be released on September 1. 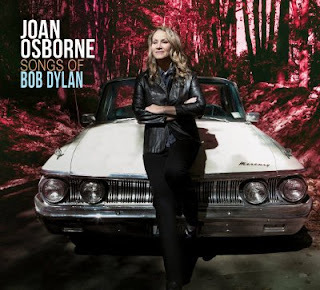 Originally announced for this spring, Osborne is currently on the road promoting the album with her "Sings the Songs of Bob Dylan" tour, an unusual show that sees the long-time star devoting her entire show to one songwriter, skipping even her biggest hit, One of Us. While the track list for the album is yet to be released, the tour gives a pretty good idea of what is going to be included with a majority coming from his 60's catalog with a couple (High Water (For Charley Patton), Gotta Love Somebody, Tangled Up in Blue) from later decades. Also not included in the current set list is Dylan's Man in the Long Black Coat which Joan recorded on her 1995 album Relish and cites as the inspiration for the album. Songs of Bob Dylan is a project I’ve been wanting to do since I first covered Bob’s “Man in the Long Black Coat” on my album Relish. Bob has been a tremendous inspiration, and I’ve been lucky enough to record with him and to sing onstage with him when I toured with the Dead. After getting a chance to do an all-Dylan show during a two week residency in NYC earlier this year, I decided now is the time to make this album.